Russell Blake » Andrew Harding Does JET Kindle Worlds! Andrew Harding Does JET Kindle Worlds! The hybrids, on their first five consecutive days off, ever, normally on permanent call-out, were requested to go on a mercy mission, from a General in the United States, they’d met the previous summer in London. They were told there’d been a hit on one of their top operatives – so serious, it was a matter of life or death, asking if Alli would turn her to keep her alive as they were unsure how to do it themselves. With the request coming from top brass in their military, how could they say no? The Army in UK offered to fly them there in a troupe carrier, so four of them and their boss in MI5, dropped everything to go, never thinking it would open a massive can of worms. Andrew: Initially, I contacted Amazon to find out why I couldn’t buy books from any of the worlds and was told by them it was only on the US site. I also asked if there was any way to write in one. They said no. I don’t like the word no, so when Russell divulged on FB he was approached to do a Jet Kindle World, I decided to write in it, compelled one night when the story jumped into my head – linking perfectly with events from book 5 in my series. I decided to wait with it written, until they changed things, if ever. I told Russell what I was doing and the rest is history. Russell: Tell us how your story links to the JET Series. Characters, setting, specific event. Is there any crossover or meetings between your characters and any of the original characters? Andrew: My main characters from the Hybrid Series, Harvey and Alli, both human/vampire hybrids, met an American nurse and her husband, General Scott, in book 5 of my series, during a demonstration they did in London, using venom to heal a soldier, crippled by an IUD in Afghanistan. In The First, the hybrids are called upon for a mercy mission, to turn an ex-operative in Special Ops. They were contacted by General Scott , who told them that Maya was so severely injured, she didn’t have long to live. Normally on call 24/7, the hybrids offer to go, without hesitation, foregoing the first time off they’d ever had…anything to help. 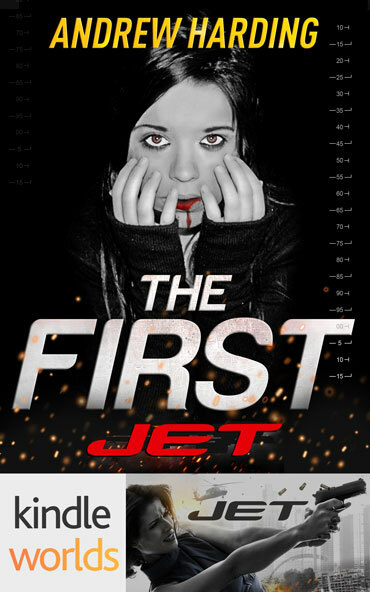 Russell: The JET Series books are fast-paced action and adventure stories. What genre do you explore in your story? Andrew: I write supernatural stories. The hybrids are detectives in a murder squad and an MI5 project in The Hybrid Series books. They too are fast paced, so the story in The First had to be the same with the hybrids involved – never a dull moment. Russell: The JET series has been set all over the world… the Middle East, Asia, South America, the Caribbean, etc. Tell us about where you set your story, and why? Andrew: This story is set near London where the hybrids work for the police. They fly to Area 51 in the desert to help Maya and then they go to New York. I won’t say anymore as it’ll spoil your read. Andrew: Harvey and Alli Burgess have been married for two years and during that time have taken other hybrids into their home. The new hybrids were all taken on by the police because of the different gifts they possessed. They’re only serious when it comes to work, making them a hoot to write into any story, but I should warn folks, they get up to some strange stuff in the series books, although The First is as clean as a whistle. Andrew: They all had to be involved. They were the hook to get the hybrids there, only the General bit off more than he could chew – not understanding the hybrids or what they were capable of. Andrew: The main theme is how the hybrids care for each other and the public at large. Their values of right and wrong are perfect for the work they do. They can’t lie unless it’s to save someone’s feelings and laws were changed to accommodate their gifts, with the crime figures climbing rapidly, especially serial murders where they deal with the most horrific crimes imaginable. So the General was really out of his depth. Andrew: Most know I have MS and writing has given me a new life and a total escape. Living with the characters in my books, buzzing around my head, is preferable to reality, some of the time. Finding I could write a compelling story, having written a trilogy at my first attempt, was a wonderful surprise to me, although I did nothing with it (published now) and went on to start the Hybrid Series. I was offered a publishing deal for the first two books in the series and went through a year of hell with them, shafting me completely. Glad, after they’d had them sitting on their FB site for two years, to be able to ask them to remainder them. Now an Indie author and master of my own ship, yes, marketing as well, I’m happy. #6 is HWSNBN (He Who Shall Not Be Named) is a free book on Amazon and Smashwords. It was written on my website, over an 18months period. This book links with #5 and #7 in places. The new cell in the free book need help with their case, so there are visits in both directions with the series characters, who finally have to help them round up their protagonists. This book gives a good hint of the series and why I started it, having had 1 Million readers online, by the middle of Feb 2015. Andrew: I was half-way through Bk1 Vault, in my new ‘The Dint Finder’ series, and half- way through the sequel to the Spirit Trilogy, Oedema, when I found out I could publish in your world. Happy to drop them both until my story was finished.